Interleukin-2 (IL-2) plays a crucial role in regulating immune responses and maintaining peripheral self-tolerance by having both immuno-stimulatory and immuno-regulatory functions. It acts primarily as a T cell growth factor, essential for the proliferation and survival of T cells as well as the generation of effector and memory T cells. IL-2 is a four α-helical bundle cytokine that belongs to a family of structurally related cytokines that includes IL-4, IL-7, IL-9, IL-15, and IL-211. IL-2 is mainly produced by activated CD4+ T cells in response to antigen stimulation but can also be produced to a much lower extent by CD8+ T cells and innate immune cells such as activated dendritic cells (DCs) and natural killer (NK) cells1, 2, 3. IL-2 binds to various forms of the IL-2 receptor (IL-2R), notably the monomeric, dimeric, and trimeric forms (Fig. 1)1, 4. The monomeric IL-2R consists of the membrane-associated IL-2Rα (CD25) chain, which also exists in a soluble form; however, it is not capable of inducing signaling events5. The dimeric IL-2R is comprised of the IL-2Rα (CD25) and IL-2Rβ (CD122) chains, with the latter also part of IL-15R. The trimeric IL-2R consists of IL-2Rα, IL2-Rβ, and IL-2Rγ, better known as the common γ-chain (γc) or CD132 and is shared by all members of the IL-2 cytokine family. In contrast to the monomeric IL-2R, both the dimeric and trimeric IL-2Rs lead to a downstream signaling cascade upon IL-2 binding. IL-2 binds with high affinity to the trimeric IL-2R but with low-moderate affinity to the dimeric IL-2R, varying the sensitivity of the cell to IL-25. Additionally, IL-2 can bind to IL2Rα expressed on the surface of activated DCs for trans presentation to neighboring cells including antigen-specific naïve T cells and NK cells that express both IL2Rβ and IL2Rγ chains4. This trans presentation of IL-2 has been shown to facilitate initial high affinity IL-2 signaling, required early in the immune response to prime naïve T-cells to produce IL-26. IL-2 is first captured by IL2Rα, bringing about a conformational change to IL-2, increasing its affinity for IL-2Rβ and IL-2Rγ7. Association of IL-2 with the IL-2R induces the dimerization of the signaling motifs in the cytoplasmic tails of IL-2Rβ and IL-2Rγ leading to the phosphorylation of the Janus kinases, JAK1 and JAK3, which in turn exert kinase activity on key tyrosine residues in the tail of the IL-2Rβ subunit8. Downstream signaling occurs via three major pathways, the JAK-STAT pathway, the phosphoinositide 3‐kinase (PI3K)-AKT pathway, and the mitogen‐activated protein kinase (MAPK) pathway. These pathways ultimately result in the transcription of target genes that contribute to IL-2-dependent biological actions, through the recruitment of the adaptor protein Shc and the transcription factor STAT5 (Fig. 1). Target genes of IL-2 signaling include cyclin D2, bcl-2, fasL, cd25 (encoding IL-2Rα), socs1-2, and the IL-2 silencing gene prdm1 which encodes for the transcription factor, BLIMP19. Specifically, the production of the negative regulator of IL-2 BLIMP1 is essential for maintaining the balance between effector T cells and Treg cells, which is crucial for immune homeostasis. Early in the immune response, the production of IL-2 by DCs requires the binding of specific microbial ligands such as lipopolysaccharide (LPS), peptidoglycan, zymosan, and CpG DNA to pattern recognition receptors (PRRs)2. Specifically, these agonists stimulate the translocation of NFAT (nuclear factor of activated T-cells) to the nucleus of DCs via the activation of the key calcium-dependent phosphatase, calcineurin3. This ultimately leads to the NFAT-dependent expression of a number of genes including IL-29. It has been shown that calcineurin-mediated production of IL-2 by myeloid cells plays a fundamental role in the gut microbiota, maintaining intestinal homeostasis by influencing the balance between inflammatory and regulatory responses of CD4+ T cells10. IL-2 plays a dual role in T cell activation by stimulating the proliferation and differentiation of ‘conventional’ T cells as well as maintaining and expanding the population of ‘suppressive’ Treg cells (Fig. 2)11. The ‘conventional’ naïve CD4+ and CD8+ T cells express the dimeric IL-2R, and therefore require a high concentration of IL-2 to induce their initial proliferation4. Then once activated, these cells express the high-affinity trimeric IL-2R, driving the differentiation of the cells into either effector or memory cells12. This differentiation is dependent upon the strength and duration of the IL-2 signal. During the primary expansion of CD8+ T cells due to low-moderate levels of IL-2, a subset of CD8+ T cells will differentiate into memory T cells13. They do this by downregulating CD25 and upregulating CD127 (IL-7R) and CD62 (L-selectin), which are crucial receptors for secondary responses upon re-infection12. During an acute infection, sustained high levels of IL-2 leads to a rapid up-regulation of CD25, and the differentiation of CD8+ cells into cytotoxic effector cells14, 15. This primes an IL-2 driven expression of the death receptor fas and fasL, causing activation-induced cell death (AICD) upon pathogen clearance15. For CD4+ T cells, the activation of STAT5 signaling by IL-2 influences their differentiation into multiple helper T cell populations, including Th1, Th2, and Th17 by regulating the expression of the appropriate receptors for each response4. Homeostatic or background levels of IL-2 is essential for the survival and function of Treg cells by maintaining the expression of FOXP3 and CD251. Treg cells naturally occur in the thymus and upon contact with self-peptides become activated. 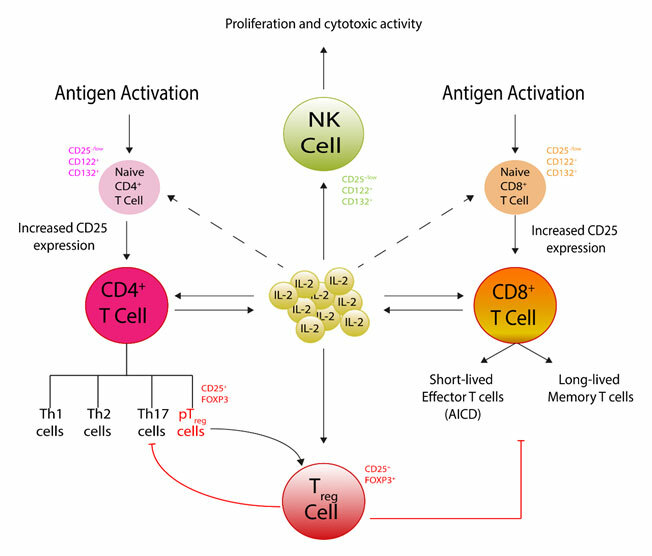 Additionally, Treg cells can be generated by stimulation of ‘conventional’ CD4+ T cells upon interaction with antigens in peripheral lymphoid organs. As they cannot produce IL-2, they are dependent on IL-2 producing cells such as ‘conventional’ T cells12. Additionally, due to their high expression of CD25 they are able to consume and limit the systemic concentration of IL-2, ensuring the regulation of the immune balance16. In the absence of IL-2, the number of Treg cells decreases and the number of effector T cells increases, leading to an enhanced susceptibility to autoimmune and inflammatory disorders. Therefore, the unique activation of Treg cells at low levels of IL-2, which does not activate CD4+ or CD8+ T cells, has allowed for the development of IL-2 as a very promising therapeutic in autoimmune and inflammatory diseases such as colitis16. The production of IL-2 from both arms of the immune system highlights the importance of this cytokine in the early stages of infection, as well as the secondary adaptive response. 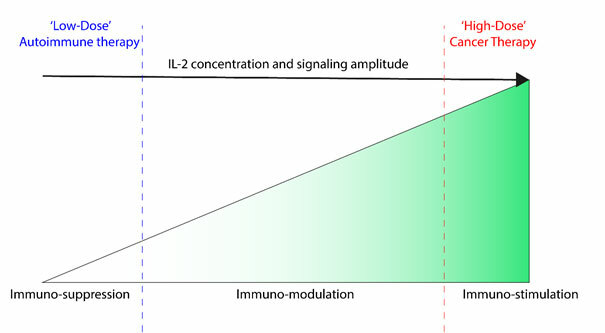 Furthermore, the dual functions of IL-2 in both protective immunity and immune tolerance allows IL-2 to be a potential therapeutic in seemingly contrasting therapies, as both an immune stimulant and an immune suppressor, for cancer and autoimmune disease, respectively (Fig. 3)17. However, more research is required to realize the full potential of IL-2 with a number of factors needing optimization, including its toxicity. InvivoGen provides the HEK-Blue™ IL-2 reporter cell line, designed to monitor IL-2 levels in a STAT5-dependent manner, for possible use in testing and studying novel less-toxic IL-2 derived molecules. 1.Malek, T.R. The biology of interleukin-2. Annu Rev Immunol 26, 453-479 (2008). 2.Granucci, F., Feau, S., Angeli, V., Trottein, F. & Ricciardi-Castagnoli, P. Early IL-2 production by mouse dendritic cells is the result of microbial-induced priming. J Immunol 170, 5075-5081 (2003). 3.Zelante, T., Fric, J., Wong, A.Y. & Ricciardi-Castagnoli, P. Interleukin-2 production by dendritic cells and its immuno-regulatory functions. Front Immunol 3, 161 (2012). 4.Liao, W., Lin, J.X. & Leonard, W.J. Interleukin-2 at the crossroads of effector responses, tolerance, and immunotherapy. Immunity 38, 13-25 (2013). 5.Malek, T.R. & Castro, I. 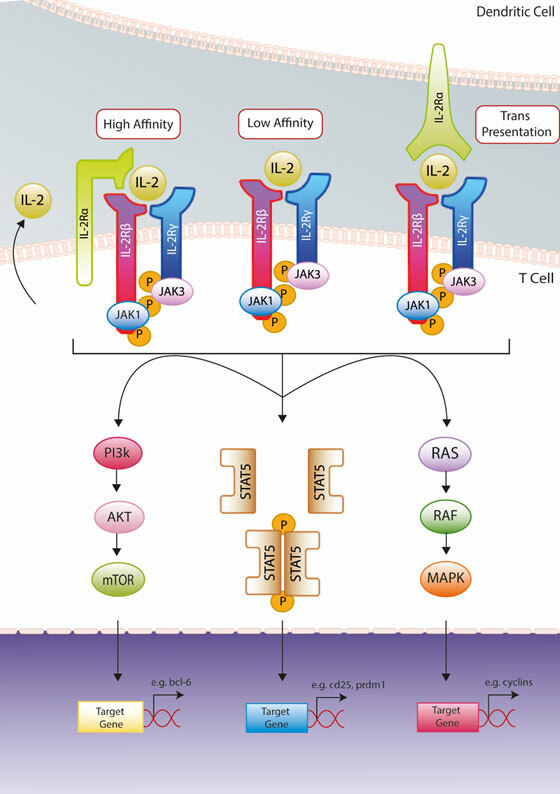 Interleukin-2 receptor signaling: at the interface between tolerance and immunity. Immunity 33, 153-165 (2010). 6.Wuest, S.C. et al. A role for interleukin-2 trans-presentation in dendritic cell-mediated T cell activation in humans, as revealed by daclizumab therapy. Nat Med 17, 604-609 (2011). 7.Spangler, J.B. et al. Antibodies to Interleukin-2 Elicit Selective T Cell Subset Potentiation through Distinct Conformational Mechanisms. Immunity 42, 815-825 (2015). 8.Cheng, G., Yu, A. & Malek, T.R. T-cell tolerance and the multi-functional role of IL-2R signaling in T-regulatory cells. Immunol Rev 241, 63-76 (2011). 9.Kovanen, P.E. et al. Global analysis of IL-2 target genes: identification of chromosomal clusters of expressed genes. Int Immunol 17, 1009-1021 (2005). 10.Mencarelli, A. et al. Calcineurin-mediated IL-2 production by CD11c(high)MHCII(+) myeloid cells is crucial for intestinal immune homeostasis. Nat Commun 9, 1102 (2018). 11.Mitra, S. & Leonard, W.J. Biology of IL-2 and its therapeutic modulation: Mechanisms and strategies. J Leukoc Biol 103, 643-655 (2018). 12.Boyman, O. & Sprent, J. The role of interleukin-2 during homeostasis and activation of the immune system. Nat Rev Immunol 12, 180-190 (2012). 13.Pipkin, M.E. et al. Interleukin-2 and inflammation induce distinct transcriptional programs that promote the differentiation of effector cytolytic T cells. Immunity 32, 79-90 (2010). 14.Choudhry, H. et al. Prospects of IL-2 in Cancer Immunotherapy. Biomed Res Int 2018, 9056173 (2018). 15.Kalia, V. et al. Prolonged interleukin-2Ralpha expression on virus-specific CD8+ T cells favors terminal-effector differentiation in vivo. Immunity 32, 91-103 (2010). 16.Klatzmann, D. & Abbas, A.K. The promise of low-dose interleukin-2 therapy for autoimmune and inflammatory diseases. Nat Rev Immunol 15, 283-294 (2015). 17.Abbas, A.K., Trotta, E., D, R.S., Marson, A. & Bluestone, J.A. Revisiting IL-2: Biology and therapeutic prospects. Sci Immunol 3 (2018).